Who doesn’t love riding a bicycle in the company of eucalypti and peacocks? For cycling and fitness enthusiasts, Pala Pitta Cycling Park offers the right amount of greens, bird watching, and more. 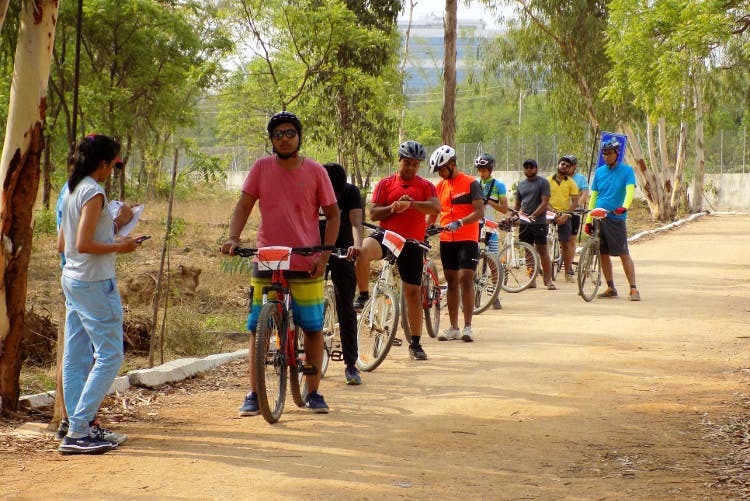 Pala Pitta Cycling Park is a reserved forest that has been developed into a cycling park by Telangana State Forest Development Corporation. With a gate that is Instagram worthy for its rustic look and wall art, this park boasts a 3-km cycling track. You can dash through the trees or slow down near the pond which is a two-way track, for that selfie we know you want to take. Say hello to the peacocks, kingfishers, and egrets that lurk around the pond, but also watch out for those pesky reptiles that pop out of nowhere. With over 7,500 trees in the vicinity, cycling is more of a windy affair than an activity. After a tiring ride, you can unwind at one of the refreshment stalls inside. But we must warn you: the weekends are chaotic and the park has over 1,000 visitors. So if you don’t enjoy crowds, avoid weekends. Did we also mention the park hosts some bicycling contests and events? So, whether you’re interested in stepping up your fitness game or meet new peeps (and peacocks and other species of birds), this one will work wonders for you. If you have a bicycle, you can simply pay the entrance fee (INR 25) and let yourself in. But if you need to rent a bicycle, you have plenty of choices. A large shed houses cycles of different sizes, colours and design, and the good folks there help you pick the right one. The entrance fee for the ones renting a cycle in INR 50, but if you are looking for something long-term then there is a monthly pass plan for you. You can also buy the pass from the website.